Sean O’Brien has issued a statement defending his comments made in an interview in which he blamed Warren Gatland and his coaching staff for the Lions’ failure to claim a series win against New Zealand in the summer. Warren Gatland and Rob Howley were the main two to come under stinging criticism from O’Brien with the Irishman defending his comments tonight. 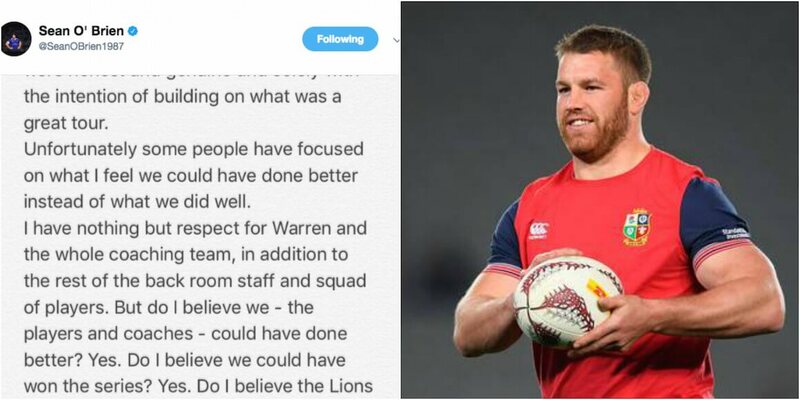 On his personal Twitter account, O’Brien wrote: “To be clear, my views on the Lions tour were honest and genuine and solely with the intention of building on what was a great tour. “Unfortunately some people have focused on what I feel we could have done better instead of what we did well. “I have nothing but respect for Warren and the whole coaching team, in addition to the rest of the back room staff and squad of players. But do I believe we could have won the series? Yes. Do I believe the Lions squad in 2021 will be better for this? Yes. “If we don’t look to build on and improve on the tour to New Zealand how can future Lions squads get better?